Just imagine a crisis situation in your place of work and evacuation is required. It may not be due to a fire it might be another threat that has occurred in the front lobby. The problem is, how do you get a specific mass emergency message out to employees and guest to take immediate action that will keep them safe during the crisis? Our new VISITOR MANAGEMENT SYSTEM is an application that manages visitors and has full featured Emergency notification system within the app. Today the solution for some organizations is pulling the fire alarm. This tactic may make matters worse for certain situations if the crisis is happening in the front lobby or the main exit of the building, as this will direct everyone in the path of danger. Obviously, this solution is not very appropriate in keeping the occupants in the building safe and present a serious problem for most facilities. The MyLobby Visitor Management System solves this problem with the ability to send a tailored or customized emergency messages. This Mass Notification System is built right into the back-end or the MyLobby’s VISITOR MANAGEMENT SYSTEM or what some my call GUEST REGISTRATION SOFTWARE. This application does more than just do visitor management. In this article, we explain how it works and how Emergency notification system for business is essential to keep employees safe. 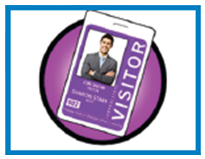 How the Visitor Management System with Mass Notification System Works? 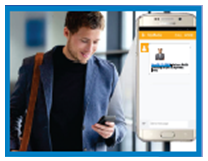 The backend of MyLobby would be configured to have the email and cell phone number of most employees. 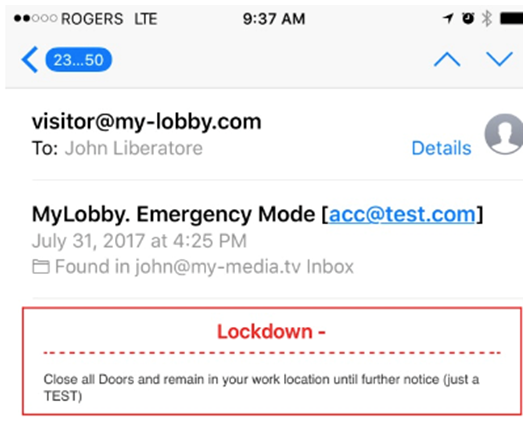 This gives the ability for MyLobby system to send instant notification via text and email notices whenever its triggered. When we started looking into the Visitor Management Software and came out with our first offering we began our research with facility managers across the US and Canada and they pointed out they had a real need have you a better way to account for all visitors they were still in the building during and emergency evacuations. For most organizations they had system for employees and but not for visitors. One of the fundamental needs was the easy-of use solution. Just imagine being in a crisis situation, naturally, we all get nervous. Having to log into an app and the then deploy an emergency message notification was too cumbersome. The clients needed the equivalent of a panic button. We have developed the Emergency notification app with this in mind. 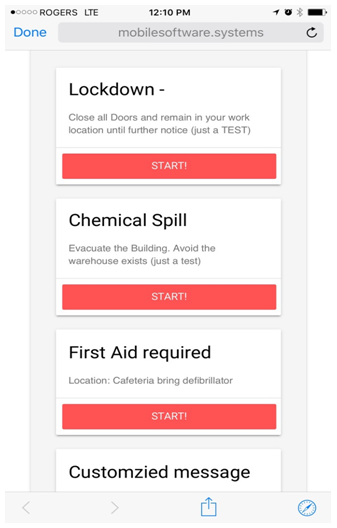 The individual responsible for deploying the mass notifications are usually either; the facility manager, security personnel, General manager or even front reception personnel , are now are able to launch the site or app and that as all of the predefined messages and on their mobile device and launch as one the emergency messages. · Evacuate the building and due to a chemical spill. Avoid the warehouse. Here a screen shots of what this notice looks like. Below is a screenshot from a mobile device of how the emergency notification looks like. How was this Emergency Notification System app developed? Have you ever had the experience using an application that did not make sense or really serve the needs of the business? This tends to happen when computer programmers and not the user’s design apps. 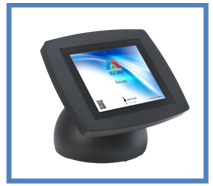 This Visitor management System was designed with the participation of the end-users. They were very engaged with the process and gave our design and development team insights, that only these were stakeholders were able to provide based upon their experience and pain points. Our approach was to conduct a series of interviews with key personnel, the Facilities Managers, General Managers, Receptionist and Security Guards. 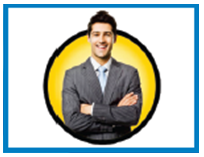 They were able to provide our team with the nuances of their responsibilities. We in turn, took then processes and systematize it into the Visitor Management App. We managed to capture the Mass Notification System Requirements of our clients with one objective in mind, to develop the very best Visitor Management System. The irony is the Emergency Mass Notification System was an after-thought. Our team initially was only focused on creating the Visitor Management System. Although, we quickly discovered this was a greater pain point for many organizations and quickly became not just a key feature but rather an essential must have for the welfare of the employees. There are also emergency events that may only require those with First Aid experience. 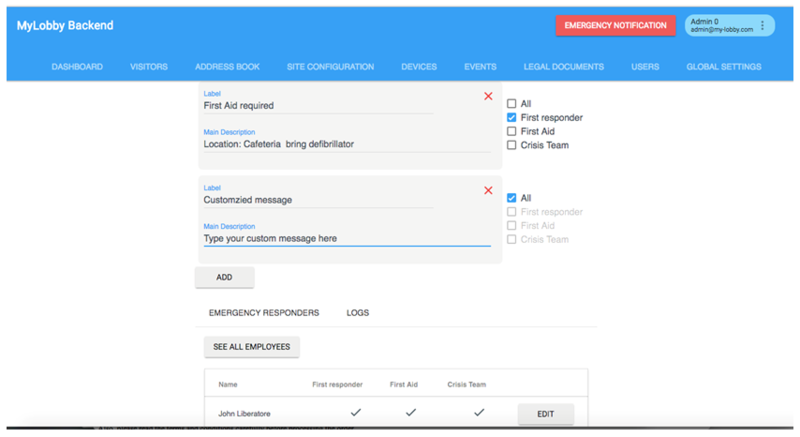 We can tailor the backend to configure to send the message to only those First responses or Crisis team . Emergency notification system Canada team was instrumental in developing this part of the program. Our Canadian clients were able to provide the insights made this part of the Mass notification software added a ton of value to a real problem too for most organizations. In conclusion, we are in a position now to make continuous improvements in our Emergency Mass Notification System and Visitor management System. In the near future, we are going to connect our Emergency Mass Notification System to fire police and Ambulance. We believe every crisis situation as the need for better and faster communication in order to minimize disruption and casualties. This is why would like to invite anyone to post their comments with additional insights and or experience in crisis situations to share their ideas of how we can add features to make Emergency Mass Notification Solution even better to save lives. In fact, we have a vision, to make this technology just as common as defibrillator in public and corporate facilities.